Business cards are essential, even in this digital age! Business cards are a powerful and inexpensive marketing tool. When you’re designing your marketing materials, you want them to be tailor-made and consistent with your industry, business, and personal style. 1. 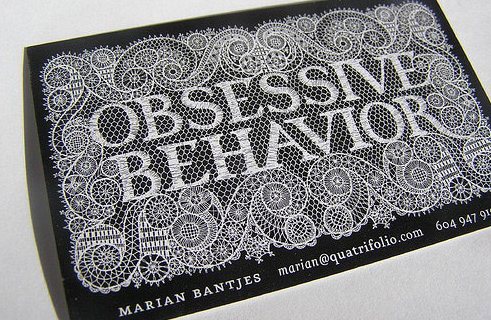 Size: Business card designs are all over the map on size and shape. As a giver and receiver of cards, I’m still old-school and recommend going with a standard size. Rounded corners, okay; die cut-out from within the rectangle – cool! But I would suggest avoiding the tiny sizes as they get lost in the shuffle after a long day walking a show floor and collecting cards. 2. Paper: In a pinch, you can print your own cards on your own printer and get a decent result. For a good, professional business card that represents you, your work, and your business, get a professional quality card stock and go with a printer who specializes in this type of work. The feel of a card is as important as its appearance. 3. Color: Go for it here. Choose color and then, if your budget allows, add a varnish coating. 4. Photo: Use a picture of yourself on the card. After collecting cards at a show, the person who takes their card out of their purse the next day will remember you, and not because you have a cool card but because they “see” you and remember your jewelry, talking with you, and what they wanted to order! 5. Message: Your business card should say what you do as concisely as possible. Don’t go overboard. One more tip – when you see a business card you like, even if it’s not in the jewelry field, put it in a “business card reference” file and go through them each time you’re ready to order new business cards. I like the idea of putting a picture on my business card, never even thought of it. Too bad I just received my new cards but I will keep this in mind for my next order. How about the art on one side and all the information (and b/w face shot) on the other? I’m not doing that, yet, but I have seen at least one artist doing this. Also, what’s your opinion on oversized, say postcard sized, business cards? Too funny! I think it’s the sly grin that gets him remembered.